1913 was a year of modernist spectacle. 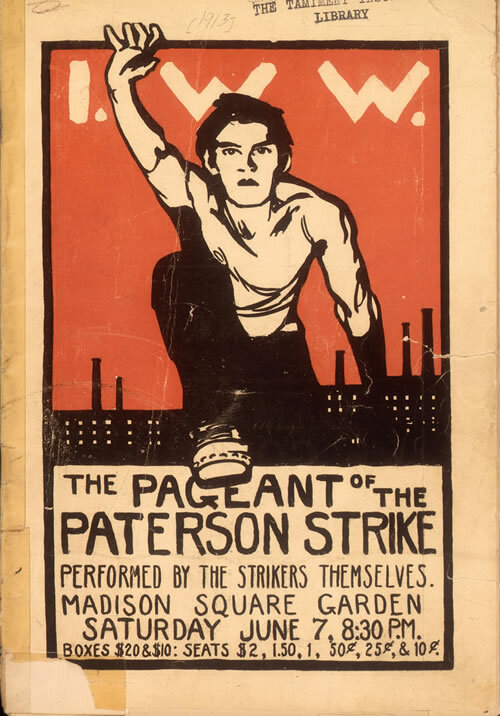 The Armory Show opened February 17th, The “Rite of Spring” debuted in Paris on May 29th, and on June 7th one thousand striking textile workers from Paterson, New Jersey performed a play about their struggle at Madison Square Garden. The Paterson Strike Pageant may seem an incongruous entry in the year’s ledger of iconic events. But for the 15,000 in attendance, the Pageant was a thrilling moment when radical politics energized a revolutionary new theater. Together with feminism, solidarity with Paterson’s multiethnic working class defined the politics of the Greenwich Village intelligentsia. In April, Village fixture Mabel Dodge suggested to Bill Haywood that the Industrial Workers of the World stage a performance to call attention to strikers’ demands and the violent response of local authorities. Journalist John Reed rushed to Paterson, landed briefly in jail for resisting police, and then spent three hectic weeks collaborating with workers on a narrative of the conflict. Steve Golin, The Fragile Bridge: Paterson Silk Strike, 1913 (Philadelphia: Temple University Press, 1988). Martin Green, New York 1913: The Armory Show and the Paterson Strike Pageant (New York: Charles Scribner’s Sons, 1988).